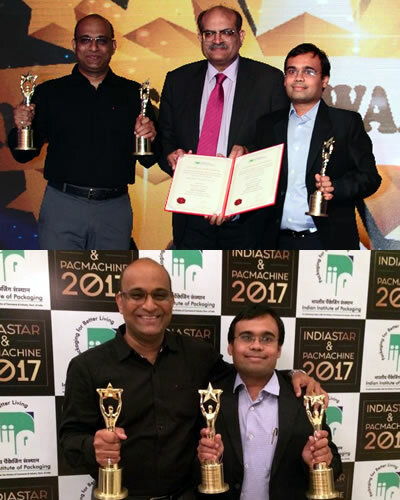 Wagh Bakri Tea Group wins India’s most prestigious packaging Award INDIASTAR 2017. Wagh Bakri Tea Group received the prestigious INDIASTAR 2017 National Award for Packaging 2017 at a gala ceremony held at Hotel Eros, New Delhi on Saturday, 28 October 2017. This award is given by India’s premier institute, Indian Institute of Packaging (Govt. of India Undertaking) to innovative packaging solutions in the industry. The INDIASTAR Award was instituted by IIP (Indian Institute of Packaging) in 1972 to promote and encourage excellence in packaging design, innovation and sustainability once every two years. Wagh Bakri Tea Group has been recognised for the innovative packaging of Wagh Bakri 100% Certified Organic Tea, Wagh Bakri Connoisseur Collection and Wagh Bakri Take Away Pack for Sandwiches. “Wagh Bakri Tea brand has gained recognition as a legacy brand which is consistently growing and we are committed to meeting the consumers’ expectations globally. I travel extensively to ensure that the quality of our product and its packaging is in line with international trends”, said Mr Parag Desai, Executive Director, Wagh Bakri Tea Group.